Finally Google has released its updated and final version of Google Earth with 3D Maps feature for Apple iOS devices users including iPhone, iPad and iPod having iOS version 4.3 or later. 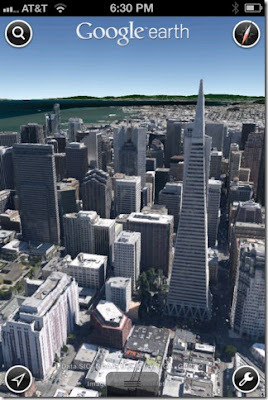 Google Earth 3D Maps Application version 7.0 is currently available for iPhone 4, iPhone 4S, iPhone 3GS, iPad, iPad 2, The New iPad 3, iPod 4G/3G Touch devices running iOS 4.3 or later version. We all know that Apple has already released iOS 6 3D Maps concept at WWDC 2012 event this year and soon they will release and integrate iOS 3D Maps on its upcoming Apple iOS 6 Firmware running devices but Google has already presented and launched Google Earth with 3D Maps concept on 6th of June and yesterday Google has updated its Google Earth with 3D Maps view for Apple iPhone, iPad and iPod devices users. Google Earth 3D Maps App is already available for Android devices users since late June and now Apple iOS users can also get Google Earth with 3D Maps Application for their iPhone 4, iPhone 4S, iPhone 3GS, iPad, iPad 2, The New iPad 3, iPod 4G/3G Touch devices running iOS 4.3 or later. The new and updated Google Earth 3D Maps App is providing 3D mapping category and 3D view for all 14 regions from all over the world including San Francisco Bay Area, Los Angeles, Boston, Geneva, Rome and others. More regions will be available through future updates for iOS and Android platforms. Google Earth with 3D Maps Application is available in several languages including English, Arabic, Chinese, Croatian, Czech, Danish, Dutch, Finnish, French, German, Greek, Hebrew, Indonesian, Italian, Japanese, Korean, Malay, Norwegian, Polish, Portuguese, Romanian, Russian, Slovak, Spanish, Swedish, Thai, Turkish, Ukrainian etc. You can explore world in 3D view with Google Earth and can explore distant lands or reacquaint yourself with your childhood home. Search for cities, places, and businesses. Browse layers including roads, borders, places, photos and more. Visit the Earth Gallery to find exciting maps such as real-time. Download Google Earth with 3D Maps App for iPhone, iPad and iPod directly from Apple iTunes link provided below. >Download Google Earth 3D Maps Application for iPhone 4, iPhone 4S, iPhone 3GS, iPad, iPad 2, The New iPad 3, iPod 4G/3G Touch devices running iOS 4.3 or later version.